At this event, people carry mikoshi (portable shrine) called Inkyo and visit the parishioners’ house where water is sprinkled on the mikoshi in the garden. 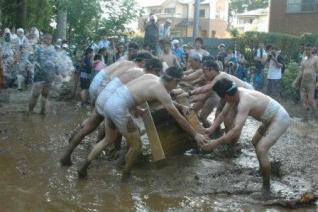 They roll the Mikoshi all around in this mud. The mikoshi takes on the role of Dashi floats and young men dressed as characters of plays and dramas get on the float and parade around the town.